WFP’s Senior Director for Strategic Coordination and Support Stanlake Samkange and Minister Fawzy during an anniversary celebration held by the WFP and the Egyptian Ministry of Foreign Affairs. In commemoration of the 50th anniversary of the United Nations World Food Programme's (WFP) work in Egypt, the Egyptian government and the WFP signed on Tuesday an agreement to exchange knowledge and expertise to achieve the UN's Sustainable Development Goals, particularly the goal of zero hunger. The agreement allows for the WFP to share and expand its expertise on interventions in areas such as water management, nutrition, the diversification of livelihoods and increased agricultural productivity. “As we prepare to chair the African Union in 2019, we are determined to take our strategic partnership with the United Nations and its specialised agencies to new levels," said Assistant Foreign Minister for Multilateral Affairs and International Security Ehab Fawzy. 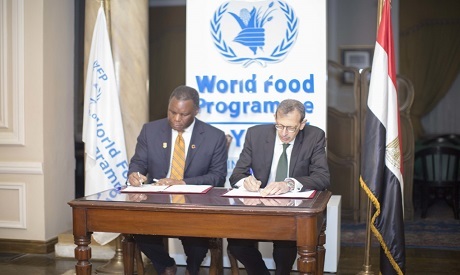 The agreement was signed by the WFP’s Senior Director for Strategic Coordination and Support Stanlake Samkange and Minister Fawzy during an anniversary celebration held by the WFP and the Egyptian Ministry of Foreign Affairs. “This is a great opportunity to showcase Egypt and the WFP’s many success stories and contribute to the development aspirations of Africa as a whole,” Samkange said. The agreement will be supported by the Luxor Coordination Centre for Knowledge Sharing and Innovation to Promote Resilience in Upper Egypt. The centre, developed by the WFP in partnership with the government, will facilitate knowledge-exchange activities, providing diverse and proven national expertise on development interventions. “WFP and Egypt’s longstanding partnership is deeply rooted in a history of thriving cooperation and mutual understanding,” said WFP Representative and Country Director in Egypt Menghestab Haile. “WFP remains a committed partner of the government to achieve the 2030 Agenda, particularly given Egypt's position as a key actor in regional cooperation,” Haile said.